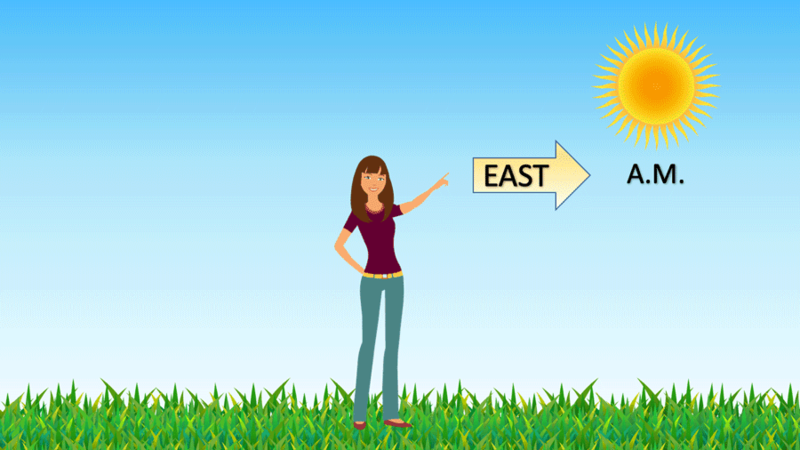 This lesson plan introduces the concept of direction to young children by using the location of the Sun in order to understand where east, west, north, and south are located. A video tutorial on how to figure out direction based on the Sun is available towards the end of this article. The way to a place is called direction. In order to find a place, we must know in what direction from us it lies. 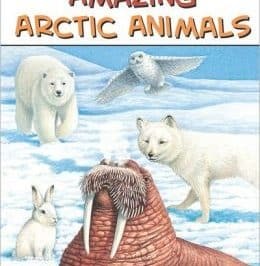 Most commonly, directions are provided in terms of whether the place lies north, south, east, or west of where we are currently located (this is known as relative location). 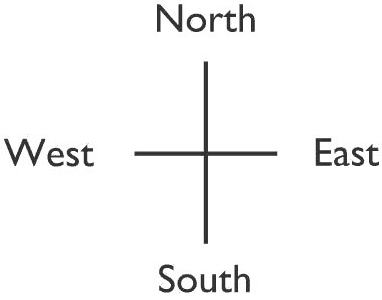 North, south, east, and west are known as cardinal directions. 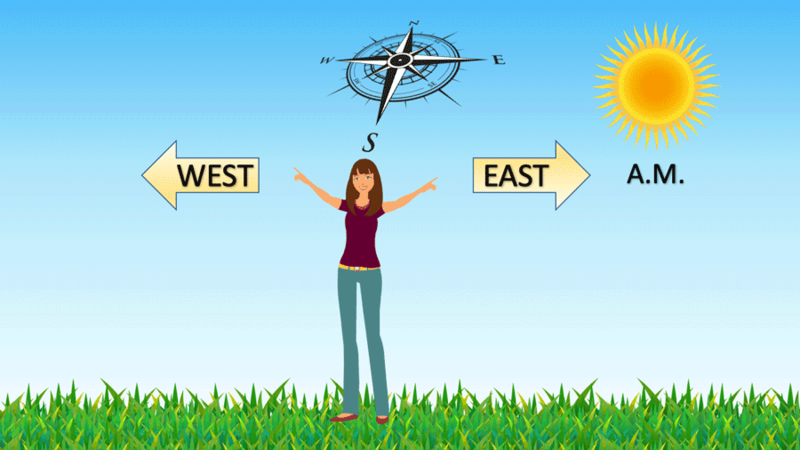 These cardinal directions can be abbreviated as N, S, E, and W.
We can use the location of the sun in the sky in order to determine direction. Stand outside in the morning and look up at the sky (never look directly into the sun). 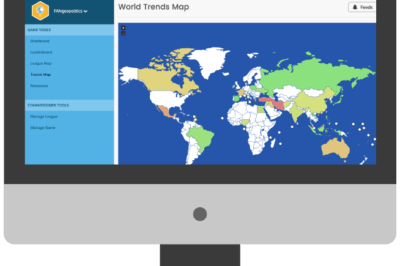 Where is the sun currently located? The sun rises in the east. Therefore, the location of the sun in the morning is towards the east. Compare this to the location of the sun in the sky in the late afternoon. The sun sets in the west. At noon local time, the sun is directly overhead. In the morning find the general location of the rising sun, stretch out your left arm so that your right hand is towards the sun. Your left hand is now pointing east. Important: make sure you never look directly at the sun. To understand where north, south, east, and west are, first point your left arm towards the sun in the morning. Now, take your right hand and point it towards the west. You are now facing south and your back is towards the north. With your left hand pointing towards the sun (east) and your right pointing in the exact opposite direction (west), you can figure out where north and south are in the morning. Stand outside the front door of your house or school. What direction is the building facing? Take and piece of paper and mark the locations of north, south, east, and west on your paper. Now draw the outline of the building with the front of the building in the correct location. Look around the building. What is on the north side of the building? Doors, windows, trees? Mark those one your paper in the correct spot. What is on the east side of the building? Draw those now on the paper in the spot you marked for the east direction. Do the same for south and west. 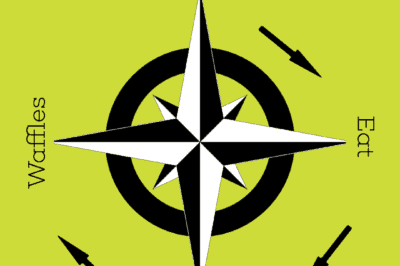 Learn about the four points of the compass. Not all culture understand direction the same way.